Money back guarantee: Yes,TheraSnore has a full 30 day money back satisfaction guarantee and a one year lifetime warranty . 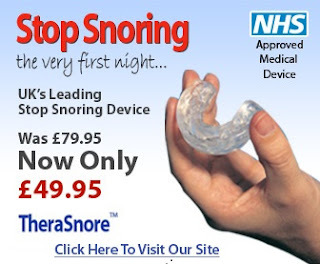 Summary: Therasnore is world's leading anti-snoring mouth guard, used by many NHS hospitals, private clinics, doctors and dentists for more than a decade. Severe snoring and sleep apnoea are two common problems that are not fun to deal with, both for the patient himself and the ones sleeping near him! This is why an on-growing number of patients are seeking safe, cheap and alternative treatment options for these problems. Today, we will present to you a product called Therasnore, an easy to use, effective, adjustable and comfortable mouthpiece that attacks both snoring and apnea. What is best about this product is that it is clinically tried [1,2] and approved both by the FDA and the NHS (UK's National Health Service), with the latter supplying it to many hospitals falling under its jurisdiction. Furthermore, Therasnore is officially the number 1 stop-snoring product sold over the world, having helped more than 1 million customers in the past decade. 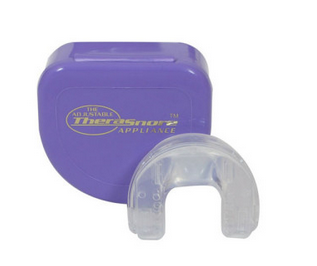 Simply put, TheraSnore is an anti-snoring mouth guard that you place in your mouth just before you go to sleep. The device is very effective in treating both snoring and mild to moderate cases of sleep apnea. How does Therasnore Work ? In most cases, snoring occurs when the bottom jaw and tongue fall back, narrowing the airway at the back of the throat. This narrowing of the airway, forces our breathing to get faster, vibrating the soft tissue and blocking the airway! This is what we all know as snoring. The device fits gently and securely to your upper teeth, preventing your lower teeth and jaw from falling back during sleep. As a result, your airway remains open, eliminating the cause snoring. It should be mentioned that Therasnore features five different adjustable settings on the expandable piece which provide a comfortable fit for the wearer while its soft edges ensure that the wearer sleeps peacefully with no discomfort whatsoever. By default, the device starts off in position 2 which allows the jaw to sit slightly forward, by around 3mm. If it does not stop you from snoring the first time you go to bed then you simply adjust it the next setting and so on until you find the position offering optimal results. According to the statistics on the official TheraSnore website, the device is 93% effective in the treatment of snoring and sleep apnea (for mild to moderate). However, by having a look over the medical literature [1,2] we found this number to be around 80-85 %, which is still great, considering that the company gives you a whole month to test the product. If it doesn't work, you simply return it and get your money back ! What do users say about Therasnore ? TheraSnore comes complete with its own cleaning solution. The included cleaning tablets, come in either an 8 or 16 month supply pack -depending on your order- and they are very easy to use. It’s important to keep the product cleaned in order to keep it free from any bacteria and plaque build-up. If you don’t keep it clean, you may end up bad breath and perhaps a nasty infection. The mouthguard has been designed with comfort in mind and the materials adhere to the highest quality standards. Since you fit the device yourself, it is customized for you and you only. Furthermore, it allows the jaw to move freely and does not cause jaw ache like other mouth pieces do. The Verdict - Is Therasnore worth buying? Overall, TheraSnore is a simple, effective, medically endorsed and cheap solution for anyone suffering from loud snoring and/or mild to moderate sleep apnoea. We really see no reason not to try this product if you suffer from the aforementioned. After all, with its double-money back guarantee there is simply nothing to lose !